ABOUT: During heavy rain these falls come alive and are similar in shape to the falls on the same system, namely Witches Leap, about 100m above them. A single thin drop hits a bell like bottom section and is visually interesting. The access for shots is limited off a small platform, but you can walk to the left and down a short steep slope to get rid of unwanted foliage in the way. PHOTO EQUIPMENT TO BRING: A very high top part to these falls which means some distortion with ultra wide angle lenses. You could consider doing a vertical panorama stitch, meaning take landscape format images going up in stages and stitching them later, and adjusting the keystone effect. But a 16mm portrait format will capture them from head to toe, so to speak. It can get splashy here so a cloth before every shot worthwhile and of course a tripod for smoothe 1/5s to 3s shutters. 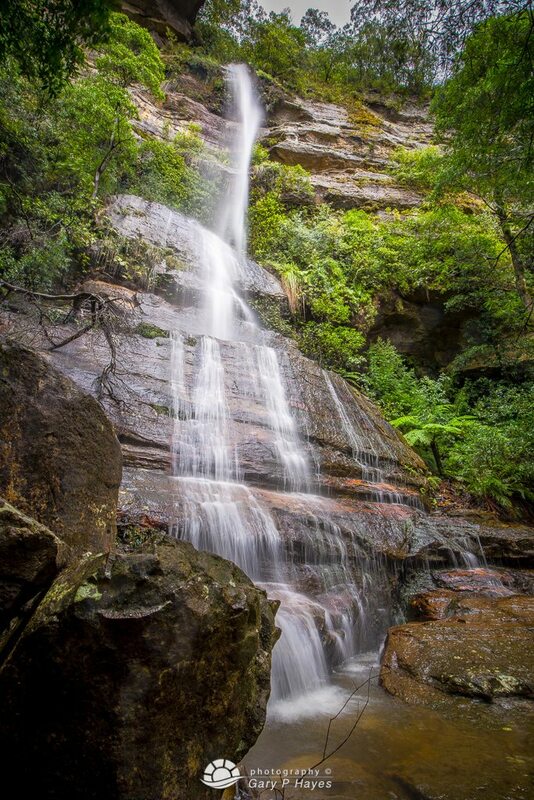 GETTING TO THE SPOT/S: This is at the bottom end of the Furber Steps route from Katoomba Kiosk or Scenic World access points. Easiest is to park at free Scenic World car park then walk down the wooden boardway to the left of the main entrance, then turn right after 100m or so following the Furber Steps sign. These falls are after the step main stone Furber Steps section as a short 50m side walk. You can walk back up about 150m or down another 15 minutes and cheat and get the Cableway back up at Scenic World ($16 ish and last one at 4.50pm).